In this ground-breaking course, acclaimed dog health consultant Milan Franks reveals the real secret to eliminating a dog’s skin problems. You’ll discover the method already used by hundreds of dog owners to rid their pet of skin problems forever. You’ll finally regain the peace of mind and pleasure that a happy, healthy and contented dog brings. Note: this method doesn’t require any radical change of lifestyle for you or your dog. You’re probably already doing some of this – you’re just not doing it in the right way. Stop the allergies and skin problems today! 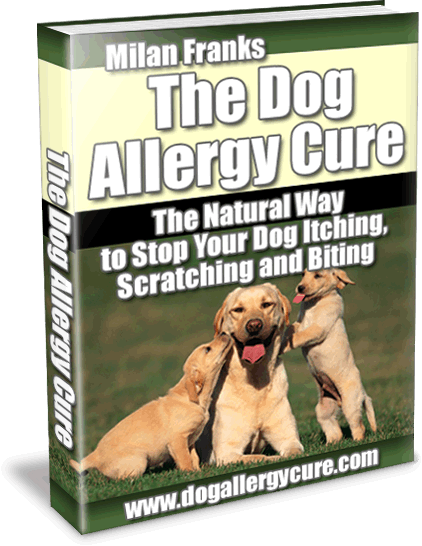 The Dog Allergy Cure will show you how to give your dog the happiness and health it really deserves. In the very few pages of this book is the most necessary information for people who care about their dogs good health and well being. My Dachshund recently started a very severe itching problem. My first thought was the new vitamins I was giving her for her severe back problems so I eliminated them from her diet. Although the scratching was less, it still continued. I then tried changing her diet and it once again seemed to help a little but not enough. I happened to find Milan Franks book on my Kindle, quickly read it and found the solution to my dogs itching with only a very changes in her diet and saved money as well. I now read every label for my dog as I have been doing for myself! Wish there was as simple and effective of a cure for my own allergies as there is for my dog! Thank you very much Mr. Frank! I’ve tried everything: creams, shampoos and even injections from the vet (which cost a fortune), but still my dog was scratching himself raw. It was driving him and us nuts! After two days with your method I noticed an improvement. After two weeks his skin had entirely cleared up – and no more scratching! Thank you so much for the advice in this book. It has literally been a lifesaver. If you do not see an immediate and dramatic improvement in your dog (including scratching and skin condition), or if for ANY reason you are not fully satisfied, simply contact us for an immediate and full refund.